I'm extremely dubious given the history of this thread and I have never attached much importance to the holy writ of an article, time will tell. However you are entirely correct in your condemnation of much of what has been said. I don't bear Kip any ill-will, I'll never meet him. As others have said a full and frank public admission that could not possibly have been faked would have closed this matter over a year ago. Its never the misdeed that is the real problem, its the denials and cover-ups which insult people's intelligence that is the real issue. Oh God, please no. I was hoping for so much more. Who else pins their bib to their shorts? About 10,000 people who ran Boston yesterday without a shirt. Dr Kip Litton was, indeed, at his dental practice y'day. This is true based on what I've discovered as well. Jim Rhodes photos are up, if anyone wants to scan through the 30k sets around the 2 hour mark. So Kip was in his dentist office yesterday. If it's true that someone picked up his bib packet, who was it? you need photo ID to pick up the bib packet, right? Could Kip have flown to Boston to pick up his bib the day before and just decided to fly back and possibly defer his 2012 entry due to the heat? Or did an accomplice pick up his bib packet? Or did no one pick up his bib packet and those who were on location and asked about someone having picked up bib #1711 all mistaken? p.s. Someone posted a while back that he was in great shape and if I recall said he was going there to break 2:50....and a lot of you believed it. You have my pity. Some highly credible sources on location told us that Dr. Litton's bib packet had been picked up. This, along with other info, gave us some reason to believe that he may actually be running. When those of us tracking Dr. Litton's bib with cell phone updates didn't receive any updates, we knew that he must've decided not to run. There was a good chance that he probably wasn't going to run anyway. After all, 60% of you predicted he would be a no show. The fact is that it's beyond any doubt that someone registered Kip Litton's name for the Boston Marathon. Given that the entry fee is $150, it seemed reasonable that it was Litton himself who entered and that there was at least a chance he would show up to race. Of course, given that this is about the most trolled thread of all time, I suppose it isn't impossible that someone else paid $150 to register Kip just to mess with everyone. If that's the case, maybe that person should be getting a profile written about them-- it's just as deranged as making up your own marathon, really. Consider that perhaps Kip Litton really did register himself to run at Boston. Remember, the registration occurred in September of last year. Perhaps he presumed he would be back in good condition to run a marathon. Perhaps his injury condition has not improved to the point where that was possible. Registration seven months out requires a leap of faith. Registration seven months out requires a leap of faith. Kip Litton running a 2:50 marathon requires a leap of faith. End the speculation: in very recent correspondence, Dr L said he'd be in Boston. He lied, again. He could have registered (and decided not to run) for any number of reasons. ...since picking up one's packet and not starting was necessary for the deferral. If you're new to the discussion and haven't read the early posts, now might be a good time to do it. Things get pretty crazy at about page 14. That is where LR detectives made their case for the Pulitzer in investigative reporting. It's pathetic to admit, but I just had a good time scanning through the first 50 pages of the thread - in the time before too many weirdos got involved and the name-calling started. Can't wait to see the article - I know some are dubious, but it sounds like it might be imminent. I'm hoping that something good comes out of all of this - especially an awareness-raising on the part of marathon race directors, and an increased willingness to disqualify runners who do stupid stuff like hide their numbers, jump on and off the course and avoid getting photographed, etc. That raises an interesting question -> what % or # of finishers are DQ'ed every year at a major marathon for cutting the course short? I thought the number was much higher than expected. Is it like 100 at a major marathon such as the Chicago Marathon, for instance? Back when I was in high school and college in the late 70s through the mid 80s, I ran lots of road races. It was always made abundantly clear to me that it was my responsibility to make sure my bib was showing and that the race personnel located out on the course writing down numbers registered that I passed by that point. I ran races sure I'd be disqualified if my bib was not showing. In 1981, when I was even more scatterbrained than I am now, I drove from Indiana to Missouri and ran the St. Louis Marathon as a senior in HS with a bunch of college friends. We stayed at the tall sponsor hotel a block from the start. As we were walking to the start line 10 minutes before the race, one of my friends asked me where my number was, and I realized it was still on the hotel room bed. So I ran up a huge number of stairs to get my number, worried (stupidly) that the elevator would take too long and even more worried that if I didn't have my number I'd get DQ'd. Needless to say, the race was rough. These days, there are lots of excellent "race rules" in the packets and on-line information for each race, but in my conversations with race directors, they are unwilling to use their right to DQ a runner when they violate the straightforward and simple rules. One RD told me he was afraid of legal repurcussions (I think this excuse was lame), while another told me that he hoped the threat of repurcussions would reduce cheating and other problems. Still another told me it was way too much work to comb through the controls for each runner. Several marathon RDs told me that they suspected wideapread cheating for Boston qualifying times, but I don't think anyone has really quantified the problem in a meaningful way. The bottom line is that Litton could have been DQ'd from every single 2010 marathon, in my opinion, because he broke the simple rule of not having his number show clearly. I got called on that once in a small-town race in Anaconda, Montana when I wore a windbreaker over my number in nasty weather. I was kind of pissed about it, but I also realized that it was my bad. Did he win the race but was DQ'ed for breaking the record? The Freep marathon gets you in the tunnel. They yell at you to show your number if it's covered up as you enter the tunnel. If you blow them off, they are waiting for you in the tunnel and they will stop you. I was on about 2:30 pace in the 80's and they had a guy pulled over who had a hand written number on a piece of paper that was pinned to his shirt. He was not in front of me for the first miles of the race as I would have seen him. His plan to enter the US illegally didn't work. This Kip guy hides his number for obvious reasons. 2) If anyone does see him, he looks like a jogger/unofficial runners with no number. 3) It's rarely exposed till the end...for obvious reasons. 5) In addition, his uniform changes would confuse someone who thought that they saw him early in the race (near the start), but it couldn't be because that guy was in all black...or was he? It is obvious as to what he did and how he did it. As many have said, it's not rocket science. Like CommonSense 101 said, there are a lot of trolls on this thread and too many people are all to quick to believe total nonsense. If you were him and you couldn't produce a time even close to what you've claim, would you run? He's accused of cheating in shorter races, so what does that tell you? Think Oscar Miranda. When put on the spot and Will Cloney asked him to run a 10k at that pace, he suddenly retired from competitive running. Hmmmm...? 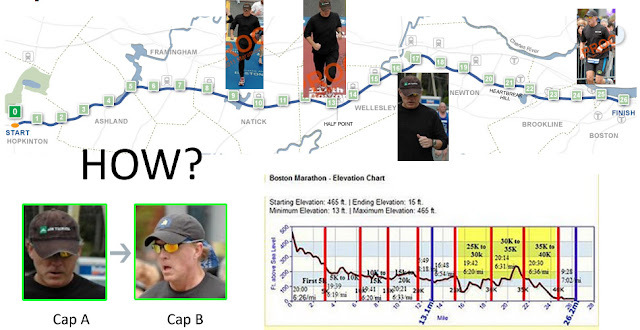 It's not rocket science, and we may all know that he (Kip) must've cheated at the 2010 Boston Marathon, but how? Since it's a point to point course with fences and thick crowds late in the race, how did he change outfits somewhere in between 30K and the finish line? How did he get a new ball cap and a bandana? His splits also only really show him going very slow from 12miles to 13.1miles.